The race was hitting its stride. 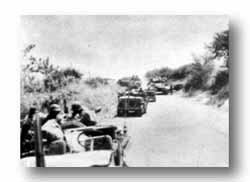 Troops were motorized, walking only when small, straggling groups of German rear-guards interfered. Even the fiercest of these battles lasted only a short time. 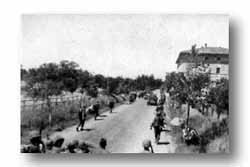 To the men of the 36th this type of war was new, quite in contrast to previous snail-like, painstaking mountain operations. 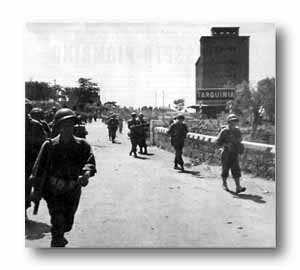 Troops of the 143rd Infantry move through Tarquinia to the front. For the enemy there was no rest. Infantry step lively to keep on the retreating enemy's heel. Building (right) served as division CP for several days.